Looking For The Best Synthesizers For Beginners? Here’s a look at our favorites, including our top pick – the Moog Sub Phatty. 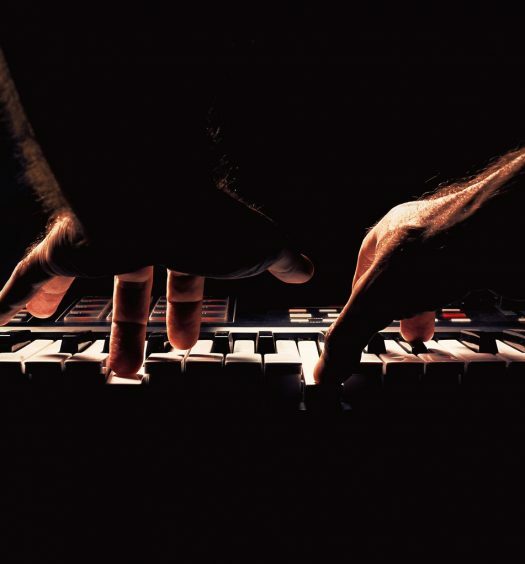 Synthesizers have been one of the most defining & world shaking instruments of our digital age. Achieving mainstream success on The Beatles albums, and Pink Floyd’s Dark Side Of The Moon, and still the same synthesizers continue to prevail today on albums like Tame Impala’s modern classic Lonerism. Our current synthesizes are smaller, more reliable, affordable, and oftentimes more robust than their ancestors. With the ability to use your new synth as a MIDI controller for your favorite DAW, it’s essentially a must buy for any serious bedroom musician or band looking to expand their musical palette. Now, let’s take a look at the five best synthesizers for beginners. Our buyer’s guide keeps in mind affordable prices and diverse functionality for the beginning synth enthusiast. Play-ability, are the keys and settings easily controlled? This wouldn’t be a synthesizer buyer’s guide if we failed to mention the Moog series. The Moog name is synonymous with synthesizers in general, since Moog’s are some of the most widely used & most effective synths out there. 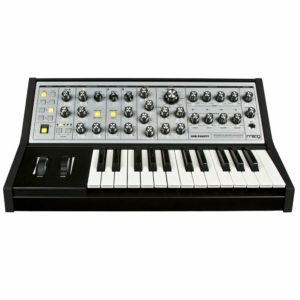 The Moog Sub Phatty is the most expensive on our list, however this is an instrument that will hold it’s value far into the future and is well worth the price. Users who have played the Moog Sub Phatty claim that they’re unable to achieve the same quality in any other synth, and it’s easy to see why players are so swept up by it. The semi-weighted keys of the Sub Phatty help give this synthesizer a premium feel, that you might expect from a full sized keyboard. With over 31 knobs and 13 switches there are a huge amount of parameters to hone in the exact synth sounds you’re after. 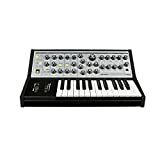 This is an authentic Moog at an unbeatable price, and simply put, the Moog Sub Phatty is one synthesizer any beginner or expert should have in their arsenal. The Korg Volca Keys is an analog synthesizer, it’s part of a line of synthesizers that can be chained together to create absolutely stunning music. It doesn’t have traditional keys onboard, but instead these touch buttons. 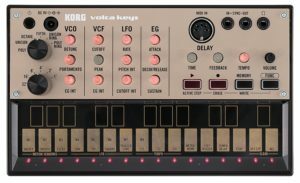 The other synths in this Korg Volca line are the Korg Volca Bass, and the Korg Volca Beats, as well as the additional Korg Volca sampler and some others. We mention this because that’s what makes the Korg Volca Keys Analog Synthesizer a must have for beginners, it’s the simple fact that it’s so expandable. One of the best parts of the Korg Volca line of synthesizers are the exceptionally compact sizes of these synths. 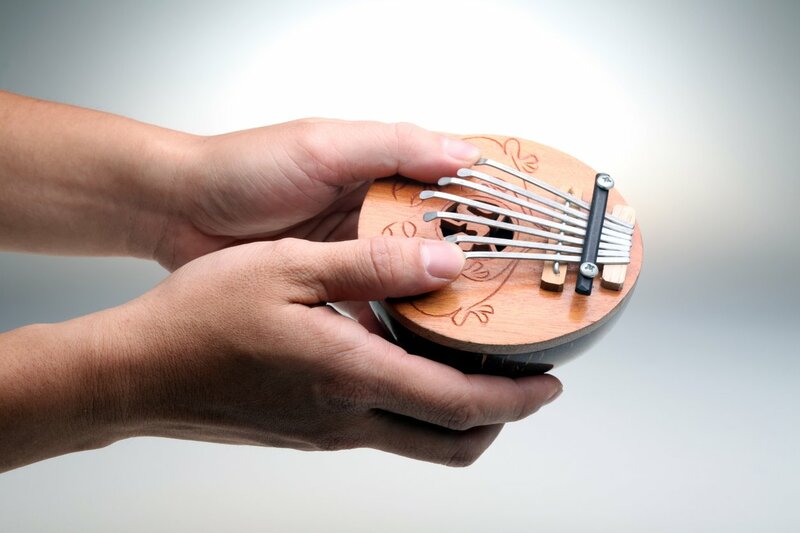 You could bring several with you to a gig, or even just on the road to make music in your spare time. This compact size also doesn’t take away from the functionality of the Korg Volca Keys unit, there are several built in effects inlcuding delay and LFO filters. This is a simple 3 voice polyphonic analog synthesizer with a structure of 3VCO, 1VCF, 1VCA, 1LFO, and 1EG. Additionally, there’s an easy ‘voice’ knob to select your overall tone, and there’s the ability to create loops. Essentially, the Korg Volca Keys has it all for a small price you’ll love. The Korg microKorg 37 -Key is a little more pricey than the Korg Volca series, however the quality of the keys and the built in vocoder alone are well worth the price tag. The Korg microKorg 37-Key is a bit easier to use than the Korg Volca Keys because there’s more space on the unit for larger keys, as well as more parameter options & built in effects via the on-board knobs. 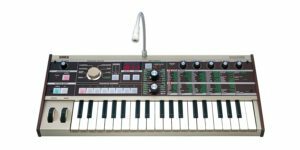 There are 4 dynamic voices to choose from with this synthesizer, and 6 different types of arpeggios ensuring that the Korg microKorg can accompany you to any jam session or recording studio. Additionally, the built in vocoder is nothing to write off because this is a powerful fully loaded vocoder unit, allowing you to get those Daft Punk vocal sounds all the way to Joe Walsh guitar solos with enough practice. The Korg microKorg is an obvious choice for the beginner synthesizer enthusiast. Also, keep in mind that if this Korg unit is too small for your liking, then there’s three different sized options to choose from including small, and XL. 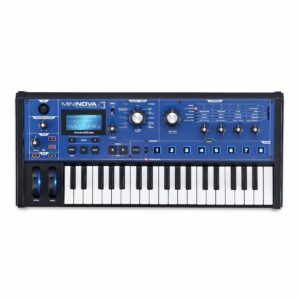 The Novation MiniNova is a powerful synthesizer in compact and affordable package. The low price point makes this synthesizer, and some of the others on our list the perfect choice for beginners who want to learn the ropes before they go all out on a thousand dollar plus synthesizer. Like the microKorg the MiniNova has a built in vocoder for when you’re feeling extra experimental. 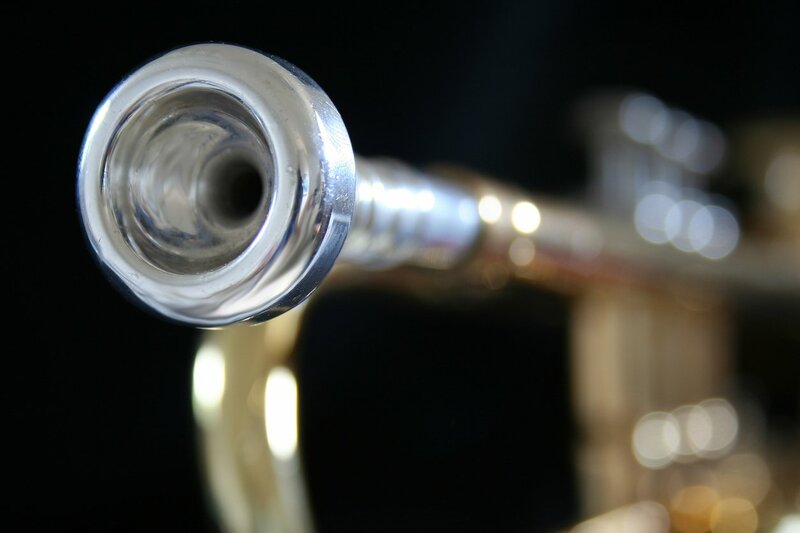 Additionally there are 256 amazing onboard sounds, and more downloadable sounds online. You can stack up to 5 effects at one time and save them to a preset, and the 37 key layout gives you plenty of freedom while you’re composing. 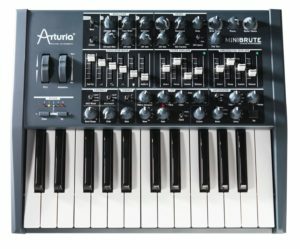 The Arturia MiniBrute is a fully capable synthesizer with more options than most other synthesizers, all contained within a very compact design. The MiniBrute is a 25 note keyboard with after touch technology allowing you to manipulate the notes you’re playing in more ways than one. The amount of parameters on the MiniBrute is impressive for a mini synthesizer. 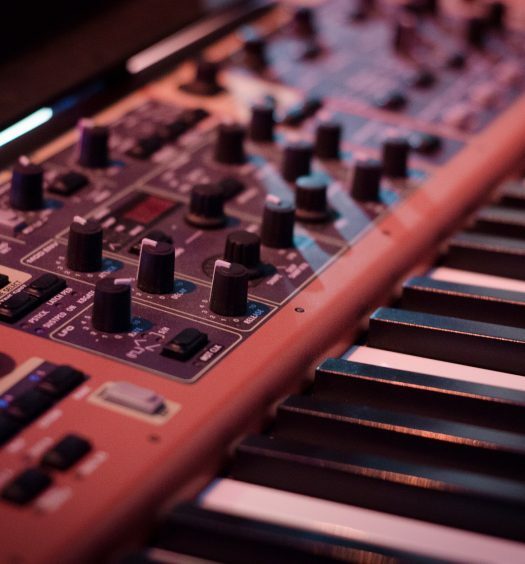 With full capability oscillators, LFO’s, filters, octaves, vibrato, and much more the Minibrute is an affordably priced powerhouse synthesizer. 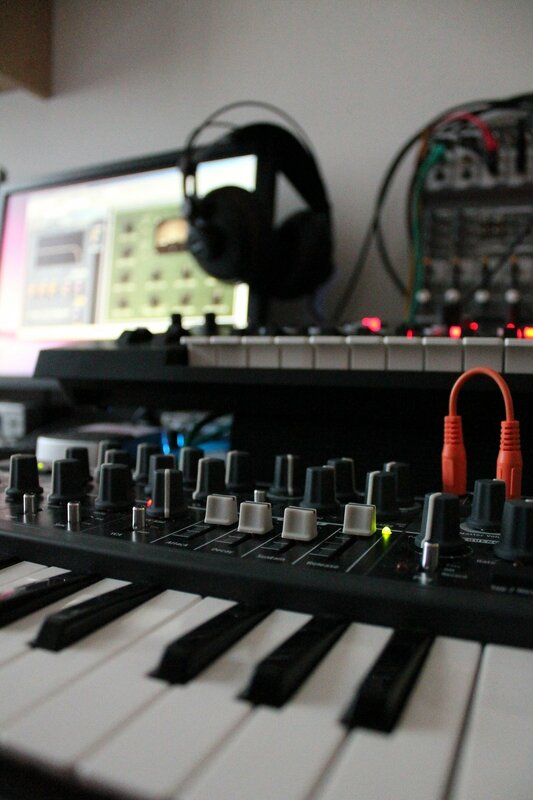 It’s difficult to find a synthesizer with better value than the Minibrute, the only real difficult decision here is choosing whether to go with the Arturia, or select between the Korg & Novation offerings. Synthesizers can be expensive, however you’re investing in an instrument that will likely last you your entire lifetime if you choose wisely. Synths add dynamic soundscapes to simple jam songs, and also add an innovative touch to any stale song demos you have clunking around. Adding a synthesizer to your jam space will ensure that your band never runs out of new and worthwhile song ideas for the future. 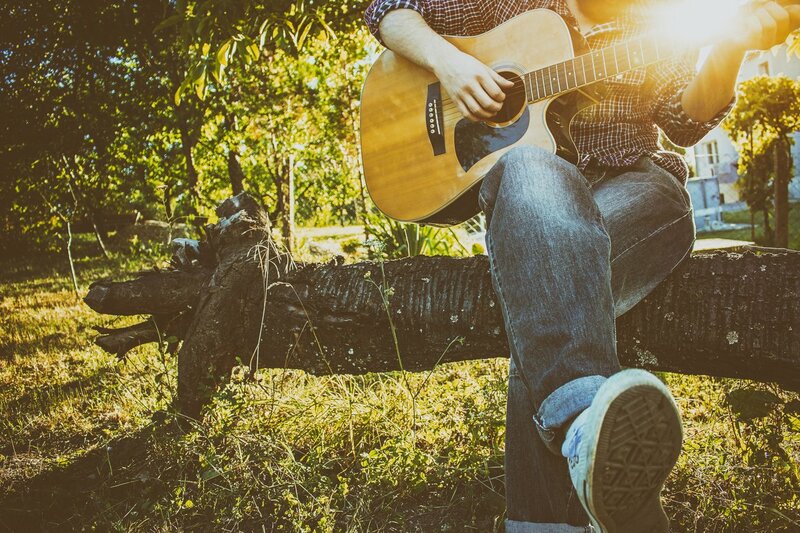 Spend less time searching, and more time playing your music. 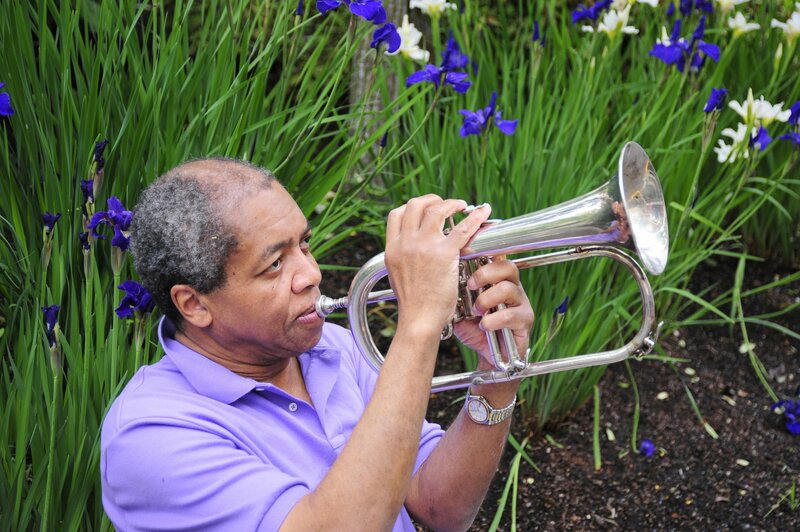 Musicstorecentral.com is a participant in the Amazon Services LLC Associates Program.